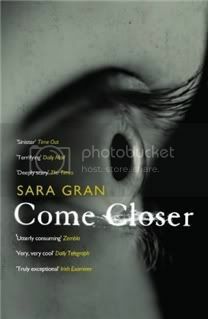 When I picked up Come Closer, I was convinced it was going to be a little out of my comfort zone. This is because… you know what, I can’t really tell you why. I knew beforehand what the story was going to be about, but this is such a short book that I’m just going to let you find out for yourselves. And “about” is entirely the wrong word anyway: the supernatural aspect of this story is one I can’t remember ever reading about before, but what truly mattered to me, what made me love this book, was the human and psychological side. I wouldn’t quite say that Come Closer is ambiguous in the same sense that The Turn of the Screw is. In this case, the supernatural is clearly identified, even named. But at the same time, the story is told by Amanda, and as it progresses it becomes increasingly clear that we have reasons not to trust her. So yes, it’s entirely possible to see Come Closer as a story about madness. But regardless of what readers decide to make of its cause, the process Amanda goes through is absolutely terrifying. We see from the beginning that Amanda is someone who’s slightly obsessed with neatness and control; with limits, with plans. And over two hundred pages, we watch her life explode out of the limits she set for it; we watch her relationship with Ed fall apart; we watch her lose herself, let go of everything she’s always believed about the universe, and drown under the weight of a new reality. The scene that terrified me the most was one where Amanda and Ed are home watching TV, and she suddenly has the impulse to burn him with the cigarette she’s smoking. The scene worked as well as it did because I’m willing to bet we’ve all had images like that cross our minds. They aren’t necessarily impulses to do these things—they're just images. But they’re still horrifying, because what could be more disturbing than the thought of intentionally hurting someone we love? And what could be more frightening than imagining, just for a moment, that we want to? I’m personally a bit wary of ever using the words “I’m incapable of”, because no matter how kind a person is, circumstances just might push them further than they ever thought they’d go. And being aware of this is probably part of what being a kind and compassionate person is all about anyway. What happens to Amanda, though, is that she loses—or gives up—the part of her that says no. And after a while, there is no going back. The lovely person who sent me this book via Bookmooch also included a Bloomsbury Review interview with Sara Gran, and I was not surprised when she mentioned Shirley Jackson as one of her greatest influences. Like Jackson, Gran writes disturbing and suffocating psychological horror at its best. This sounds really interesting - but i have to ask, is it gruesome/gory? I mostly ask because you say she had an impulse to burn him, and I'm trying not to imagine a descriptive passage about subsequent burnings, you know? You know how squeamish I am about some things...I figure I better ask before putting this on my TBR list. OH, I love these kinds of books! I like a few questions hanging, and I love the supernatural (however based on my experience with "true story" supernatural, I think I'll take the fictional). The idea of acting on irrational impulses is terrifying! I mean, I would imagine we all are one impulse away from losing it. This is an author with a pulse on the human psyche! This sounds really scary. It actually sounds like it might give me nightmares. This sounds interesting. I like psychological horror like this, because I often wonder if those phenomena are all about the mind and its perspective. Our ability to go further in thought and action than our usual morality allows is a terrifying thought. And I think the human and psychological side of horror or the supernatural are what creates the terror. Without that, blood without the brain, is like watching a wolf eat a bunny on a nature show. Sure you feel bad and you might cringe a bit, but you're going to fall asleep just fine. This sounds soooo creepy! Now I'm going to have to try it, even though I'm freaked out just from having read your review. I mean, even the cover is terrifying! I must read this. I like scary books that take it a few steps further and turn it into something thoughtful. This sounds like something I would very much like. It's always scary to imagine what could happen if we let our worst impulses run rampant. This book sounds amazing!! I'm off to try to bookmooch it myself. Great review, Nymeth--gripping! The cover is totally creepy and it sounds like the book is too. This one might give me bad dreams. I want this one. It sounds like a book I would love. I shall definitely add it to my list. Ach! I don't think I could read this one; nevermind nightmares, I'd have day-mares! What a nice surprise that you were sent the interview with the book. I had not heard of this book before reading your review. It sounds interesting, and quite creepy. Wow, sounds like a real page turner! :-) Fun! it sounds like the opposite of comfort reading! Disturbing?? Sounds just like something I would enjoy reading!! If you're comparing Gran to Shirley Jackson, then I will have to keep an eye out for her, though it sounds a little "out there" for me. This sounds really really good! And what a cover and title...completely attention grabbing. This sounds really good. I guess no one really knows what they are capable of. That is a creepy thought. That sounds very well done. I am tempted by it. OMG...this one sounds terrific, and that eye on the cover...WOW. Fabulous review. It sounds a little too horrifying to me, especially after reading your reply to Amanda. I'm definitely in the squeamish crowd. This sounds like a book I need to read. What a great review. I cannot wait to read this. This sounds kinda scary, but I love scary. I just hope it's not too disturbing. By the way, drop by my blog. I have an award for you! Whoa. This sounds sooooo good. And you know, even though you couldn't quite say why this one stretched your comfort zone, I can see why you might have thought that. It doesn't sound like a book I would have imagined you reading...and I can't quite say why I'd thought that either. ;) I'm so glad you enjoyed it! I've been rewarded so many times for stepping outside my comfort zone...thanks to all of you! I'm tempted on this one. Thanks for the review, Ana! It piqued my curiosity. Sandy: I imagine that we are too (eek! ), and this book really explores that well! Priscilla: Yeah, that's pretty much my take, but then I'm quite the sceptic :P But this book can be enjoyed on both levels! Steph: I found the cover terrifying too! And the book too, of course. Andi: I hope you find it! Kathy: Like I was telling Jeanne, it really might! Vivienne, I hope you enjoy it if you pick it up, and that it doesn't scare you *too* much! Marie: It's quite a page-turner, and also a very quick read! I don't often read books that N recommends to me because we don't have compatible reading tastes .. usually. However, I did read this after he did and liked it more than I thought I would! It's not my sort of thing, but was still worth reading. ds: I thought it'd be too out there for me too - I was surprised with how much I loved it. Jenny: She had quit smoking until the...thing started, and then she begins again and it all leads up to the burning episode :S But yeah, definitely better wait if you're not in the mood for spooky books! Lisa, I'm glad to hear it! Diane: I thought the cover was VERY creepy too! Vasilly: I hope you enjoy it! Hazra: Aww, thank you again! It IS pretty disturbing, I won't lie. But not gratuitously so! It's subtle too, you know? Debi: I kind of want to tell you what the thing I didn't say is, BUT at the same time I don't want to because a) spoilers and b) it might make you hesitate, like it almost did me, and then you'd be missing out :P You can google if you're super curious, though, as most synopses do mention it :P It's not TOO much of a spoiler anyway, but since this is only a novella I thought I'd give away as little as possible. Clover (the name change confused me for a second :P), I didn't think it'd be my think either at first! Wow, this sounds like an incredibly scary read. It really sounds interesting, and I am going to be looking into it. Dangit Nymeth! every time I visit here I walk away with more books that I need to have, right now! I really admire your ability to make so many books seem irresistible to me. I think I read this one in practically one sitting. It is scary in that you can really imagine some of the stuff. This book reminds of me of just a good old fashion type ghost story you know. Unfortunately I read her other book, Dope, and thought that didn't work as well. Then again it was billed as a mystery and to me it wasn't a real mystery more of a mixed genre type book. I live in a converted warehouse not unlike the one the heroine lives in in this novel, so it scared the bejesus out of me. Amazing book, and one I'm lucky I read while traveling. Her book DOPE is fantastic as well.